American nationals holding U.S.A. passports need an entry visa for Uganda. Naturalised American citizens of Ugandan descent need an entry visa for Uganda. 1. You must be in possession of a valid passport issued by your government. Your passport must be valid past the date of your expected departure from Uganda. a. An International Inoculation Certificate against Yellow Fever. Go to the Uganda Embassay in Washington Web site and follow the steps as laid out. The processing fee you pay depends on the category desired. The categories are based on length of stay or number of entries. *Express processing is available at an additional charge of US$10.00. There are no direct flights to Entebbe from the US but you can fly via Europe - Belgium (Brussels) and the United Kingdom (London). There are also various options from other African countries such as Kenya (Nairobi), Tanzania (Dar Es Salaam/Arusha), South Africa (Johannesburg) and Egypt (Cairo). If you are on an extended East African safari then entry to Uganda is also possible via Kenya or Tanzania. Entry to game reserves is not cheap. The prices are not as prohibitive as Kenya and Tanzania, but they do add up if you visit a number of them. We paid close to 100USD for two days entry into the Murchison Falls National Park and another 14USD camping fee on top of that. Most pricing for tourist related activities is in US Dollars. Often payment is accepted in either US Dollars or local currency so check out exchange rates before making any decisions. In Uganda you get better rates when changing large notes ($50 or $100) than small ones. Only new $100 bills are accepted. Currency is freely changeable in Uganda and US dollars are widely accepted. Travellers cheques are accepted in large centres but not in smaller places or locally run facilities. Exchange Rates as of March 2003: 1USD = 1910 Uganda Shillings. The roads aren't wonderful and some are badly potholed, but they're generally passable for most of the year. As in most places in Africa, the Matatu (or taxi) drivers are scary!. It is not recommended to drive after dark and it is highly recommended to be cautious at all times - these guys come at you at hair-raising speeds. In Uganda, one drives on the left side of the road, which can be very disorienting to those not accustomed to it. Ugandans all learn English at school, which is a great bonus to travellers. In addition, even though everyone says this about every country they visit, Ugandans really are friendly and helpful towards strangers! Visit www.traveluganda.co.ug for one of the most informative websites on Uganda. It offers loads of practical advice and is regularly updated. 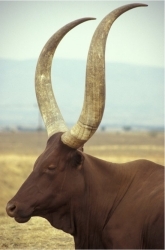 What makes it unique is that, even though its owned by the Uganda Tourism Authority, it is developed by a person who has travelled extensively in Uganda and visits at least 2-3 times a year. This means that you are guaranteed the latest, up-to-date information. Renee Pattle is a South African with a passion for all types of travel, particularly exploring the African continent. Rene lived in Europe for three years during which she travelled extensively in Europe but Africa remains her first love. Her most adventurous travel experience would have to be when she crossed Africa from North to South in her own car. This entailed visiting countries like Sudan, Libya and Ethiopia and it has forever changed the way Rene looks at the world! If you think that the typical Africa countryside doesn't offer you rolling emerald hills, snow capped mountains, misty forests and deep, crystal clear lakes then you haven't been to Uganda. Even though Uganda is a small country, it offers all of this and a lot more - white water rafting, gorilla tracking, game viewing and some of the best trekking in Africa. Most importantly, the friendly and relaxed locals all speak excellent English. What more could you ask for from an exotic holiday destination? I arrived in Uganda after 2 months travelling in North Africa (Libya, Egypt and Sudan and another month in Ethiopia). The time spent in the desert definitely contributed to the initial impact Uganda had on me, but even after a week there, it was still as beautiful and friendly as it appeared on the day I arrived. Jinja, near Kampala, is a good first stop for a couple of days of relaxation. It is a quiet town with a wonderfully relaxed atmosphere and also, it is the home of Uganda's white water rafting industry. The rafting is awesome; they claim more grade five rapids than the more famous Zambezi rafting. What I can say is that at $65 it is certainly cheaper! We did the trip with Nile River Explorers, which is run by some very friendly South Africans who even throw in a night's free accommodation at their magnificent campsite. It is a full day's entertainment with the rafting rounded off by an excellent meal near the river. Jinja is also at the source of the Nile so don't miss out on the visit to the plaque marking the spot where the Nile leaves Lake Victoria on its long, long journey to the sea. There is a definite mystique attached to the Nile, something quite exciting knowing that the water flowing past your feet will continue its progress through the deserts of Sudan, past the Valley of the Kings and through Cairo to Alexandria. The only place to stay in Jinja (well, according to most travellers), is at the Nile River Explorers' campsite perched above the Nile. In a country full of superlative camping spots this has to rate as one of the best. In fact, it has to rate as one of the best camping locations I have seen anywhere, followed closely by the spot at Murchison Falls, but more about that later. Take the time to sit above the riverbank and watch the mist rising from the water in the early morning light. It doesn't look like the real world and seems more like the scene from a movie about Avalon or what I would imagine a lost kingdom to look like. 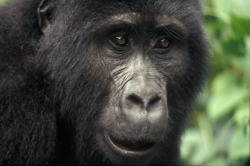 Uganda, of course, offers one of the travellers "must do" excursions, which is the fabulous gorilla tracking trip. There are two options - Mgahinga and Bwindi - both in the Southwest. 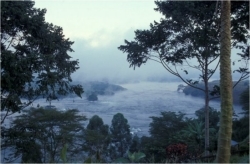 Bwindi, in the impenetrable forest, comes in at $275 per person and Mgahinga, on the Virunga volcano range, at $220. The price is as good a reason as any to select one above the other. In terms of security, a huge effort has been made to assure tourists of their safety and armed guards accompany every group. While the race for permits has never quite reached the same hysterical pitch since the 1999 attack on tourists, the demand is growing and we were lucky to get in without booking. A little forethought here is recommended and any Ugandan Travel Agent can help you with bookings. The reason for the lack of space is simple; only six tourists per day are allowed at Mgahinga and 12 at Bwindi (6 tourists per habituated group of gorillas). Wherever you decide to track gorillas, the experience is all it promises to be and a great deal more. Having tried at Mgahinga without luck we arranged permits for Bwindi where we had a long walk in, a couple of hours of fighting our way through the forests behind machete wielding guides. The walk takes you to the spot where the gorillas were last seen and then from there you fight your way through the forest following their trail. It was hot and humid and pretty hard going and the terrain is very hilly - you soon understand why they are called the impenetrable forests. When you do finally get to see the gorillas you forget everything and the experience is immediately worth every drop of sweat and every dollar paid. You are limited to one hour with the gorillas and the time just flies by. You are warned to maintain a distance of five metres from the gorillas, but the gorillas don't follow the same rules! We had a very inquisitive young visitor who kept coming closer and closer! Make a point of taking a good camera, I don't generally take pictures just to impress people back home but a shot of a gorilla filling the frame takes some beating! The Ugandan game parks are less famous than those in other East African countries but they are still beautiful. Murchison Falls and Queen Elizabeth National Parks are the places to go. 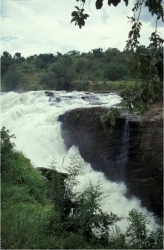 The campsite at Murchison Falls is just above the falls and is wonderfully located. It is also only accessible by 4WD so tends to be quiet - unless of course you meet up with an overland truck. An excellent way to see the wildlife is a to take a boat trip. There are huge numbers of birds in Uganda and in both parks there are so many hippos in the water that you feel as if you can step out of the boat and walk to the river bank on their backs, never getting your feet wet. It's wall to wall hippos with a few crocodiles circling nearby. Fort Portal is where you will end up if you are lucky enough to get the opportunity to trek in the Ruwenzoris. They have reopened after a few years of closure due to the problems in the DRC. This mountain range has a number of permanent glaciers and the peaks have exotic names like Margherita, Alexandria and Vittorio-Emmanuele. They rise out of the clouds from the forest floor and it is a wonderful sight, particularly from the balcony of the Ruwnezori View Guest House where you can enjoy the view while relaxing with a cold beer. Even if you aren't trekking, there are enough attractions to entice you to Fort Portal. It is a lovely town surrounded by rolling hills of tea plantations with the brooding Ruwenzoris in the background. The town is also near the Kibale National Reserve where you can do some chimpanzee tracking. There are some wonderful community campsites along the Crater lakes - pick any one of them, preferably the quietest, and just enjoy. While the facilities may be limited, the location can't be beaten. 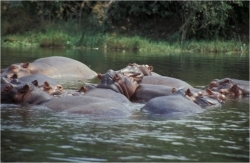 A wonderful aspect of Uganda is the approach to community tourism. Wherever you go, there is a community campsite and they are often conveniently located right outside park gates. All the benefits at a fraction of the cost! In addition, you also know that you are giving something directly back to the community. It is a great opportunity to meet locals, share a beer and have a chat. In fact, at Mgahinga, we went with the campsite owner on a walk through the village and we were treated to a display by the village blacksmith who made us a knife; it was fascinating to watch a knife being formed from a lump of steel over a fire heated by goatskin bellows. If nothing else, when you stay at a community campsite, your presence serves to entertain the local kids as you set up camp and prepare dinner! When it comes to practical matters like food and drink, there are many options. Kampala is well equipped and the many roadside markets sell the most wonderful range of fruit and vegetables. They also sell interesting things like meat, or chicken, on a stick and plenty of Nile perch. Plantains are a staple food in Uganda; give them a go, anyone at a campsite will prepare a meal of matoke (mashed plantains) or anything else, for a very reasonable price. There is also plenty of beer available. If you end up in Mgahinga, which is where Uganda, Rwanda and the DRC meet, try some of the interesting imported beers - I don't think beer from the DRC makes it to many other places in the world. Of course, in Kampala you can stick to international brands if that is what you prefer. In all aspects, Uganda offers an experience that is as varied and exciting as you want it to be. What you see and experience are only limited by your imagination and sense of adventure so don't let anything put you off discovering a place that truly is the Pearl of Africa.